This single-family home remodel was driven by the homeowner’s desire to “do the right thing” in the context of a neighborhood, which is witnessing a change of character as the small houses of its quiet past are getting replaced by large luxury homes. One of the biggest initial challenges was to resist the temptation to increase the size and height of the house in order to gain even better views, to resist keeping up with the Joneses. The house already had an expansive view of Puget Sound. The owner also did not want the house to compete with the land for attention or resources. The house should be humble and respect nature, a metaphor for walking lightly on the earth. The site also had its physical challenges. It is classified as a Critical Area due to its steep slope, and there is also an eagle’s nest nearby. Given these site challenges, minimizing the house’s impact on the site was established as an underlying guiding principle early in the design process. The footprint of the house was kept intact and the exterior changes were kept to a minimum. Even the deck and landscaping walls (both of which needed replacement due to failures in the materials) were rebuilt within the same size and footprints. The landscaping plan included removing invasives and returning the site to native vegetation. The original house was built in the 1940s and had endured various additions over the years. 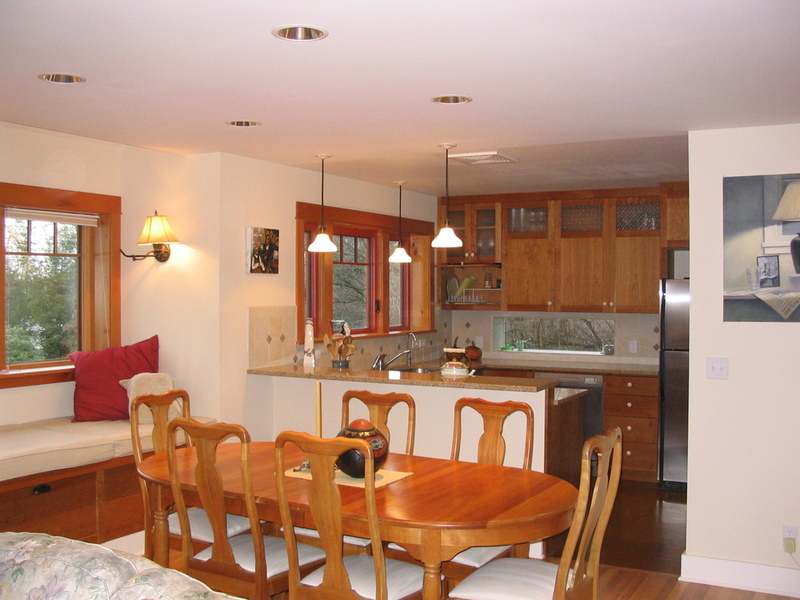 Another objective was to blend the division between the new remodel, the former remodels, and the original house to make the house feel whole again and not a collection of random pieces. The use of salvaged materials and the reuse of existing materials were high priorities among many sustainable goals that included the conservation of energy, water, and materials. The house received the honor of being the first Built Green 5-Star Remodel, scoring 428 points. This is significant given that the owner hadn’t actually set out with that goal at all. The topic was only seriously considered during construction. While the owner wanted to demonstrate and promote sustainable building, in the end it wasn’t about the points, it was still about “doing the right thing." 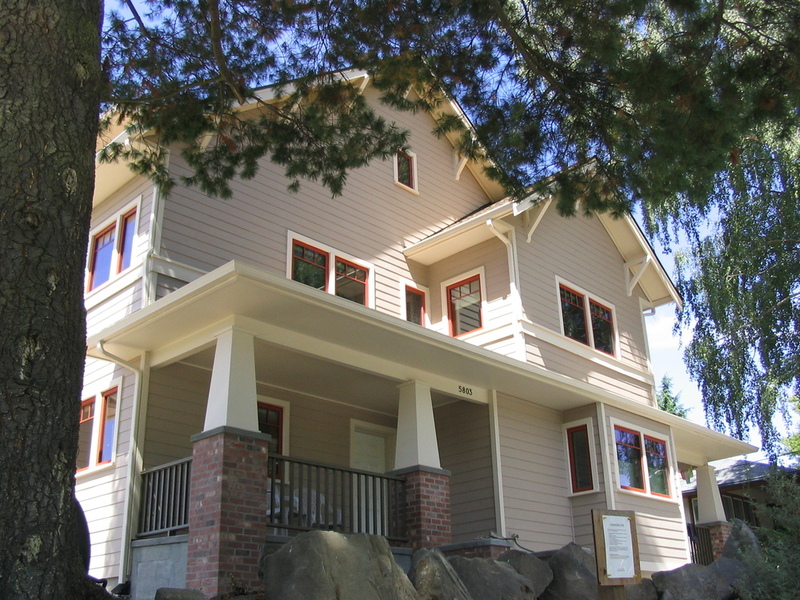 This 1904 home was built by partners of the Pantages Theaters. Oak floors with marquetry borders, ornate plaster ceilings, beveled glass windows, molded trim, and carved figureheads create an elegant home. Unfortunately a multiyear leak had ruined a corner of the dining room, so specialists were found to match the original decorative plaster and basket weave inlaid flooring. Workers painstakingly set 10,000 finish nails into the flooring. We undertook a thorough sealing of the old walls and attic, insulated the basement with polyiso, and blew piles of cellulose in the attic. 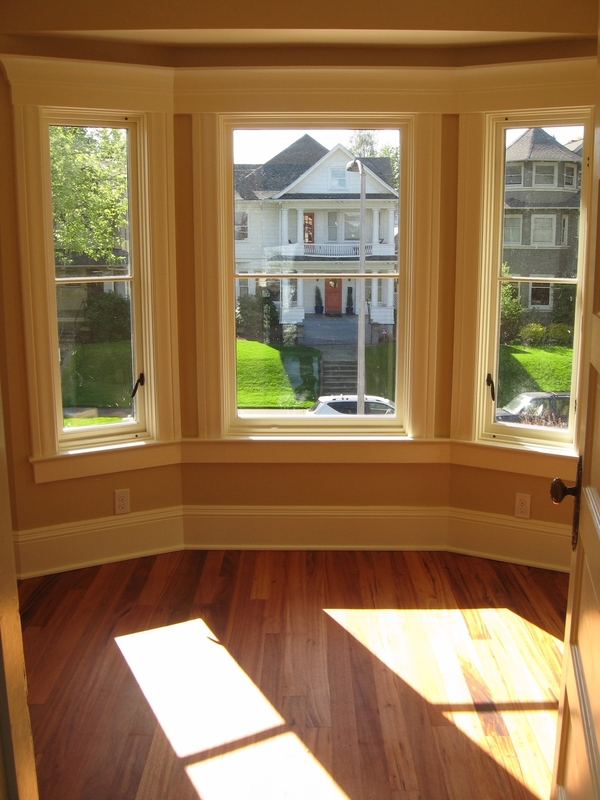 Windows on the second floor and basement were replaced with triple-glazed units, while the elegant first floor windows were refurbished and fitted with interior storms. Barred from removing the interior plaster or exterior stucco, we insulated the first floor walls from above. Analysis of dollars per BTU saved guided our decision to not remove the stucco to outsulate with mineral wool. In the end, we cut heat losses by 84% from an EUI of 121 to just 19, and received Built Green 4-Star certification. 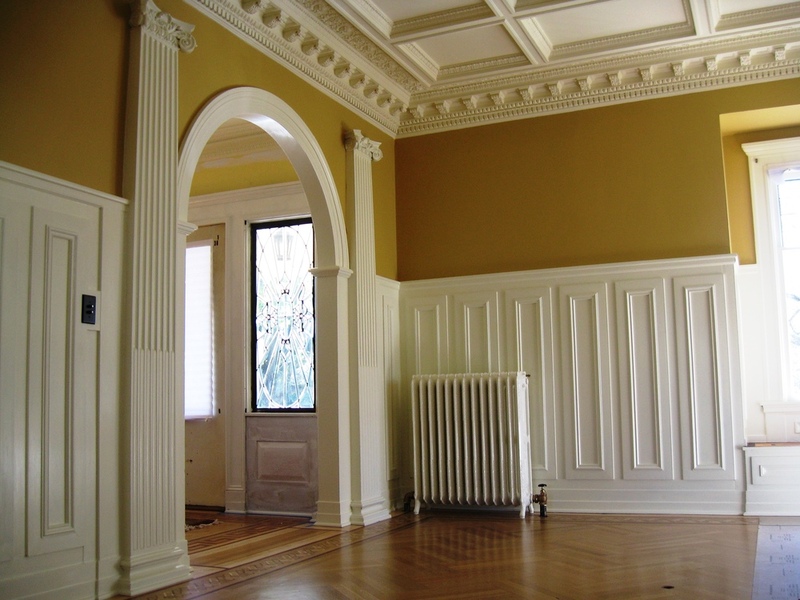 The entire second floor was demolished back to the studs, except for the elegant central stair hall. 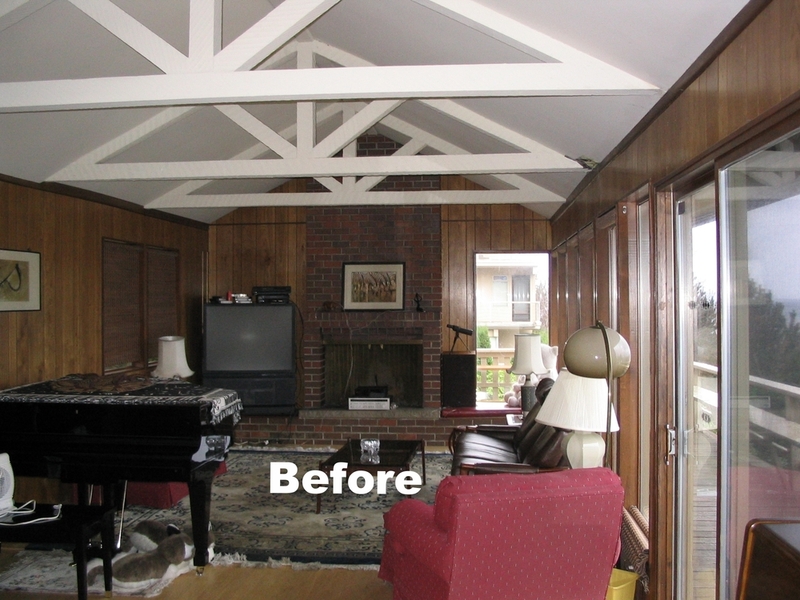 The floor plan was completely rearranged to fit three bedrooms plus a study under the existing roof. New waste plumbing pipes were threaded down through the house in two directions to serve the new family bathroom, split into a bathing chamber and a toilet chamber. 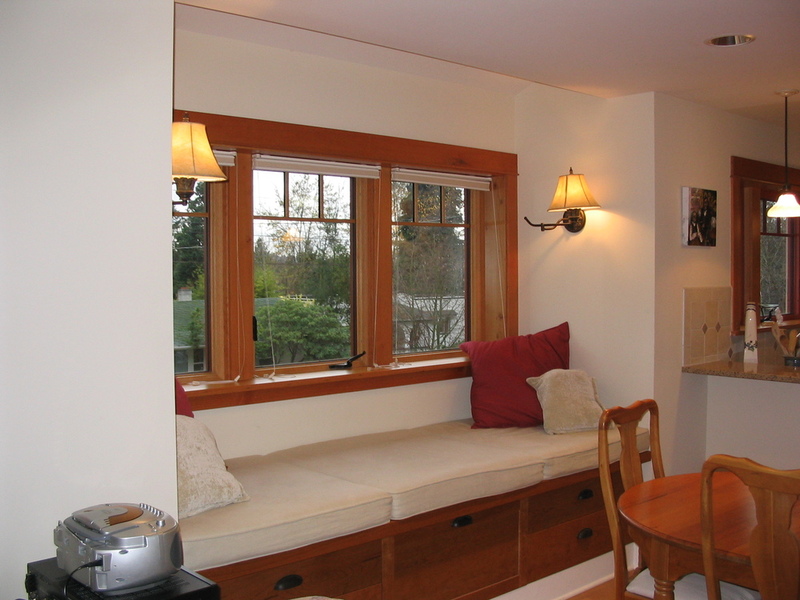 The old servant kitchen, tucked away in the back with its own separate stair, was replaced by a new mud room and bathroom. 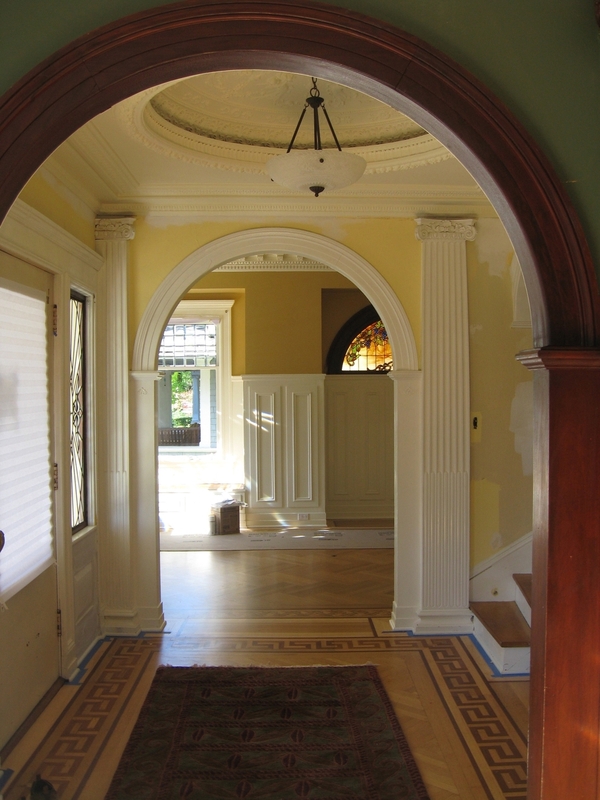 The old three-foot door from dining to kitchen was widened to an eight-foot archway, carefully replicating the door casing so it appears to be original. The new kitchen has views to the back yard garden, soapstone countertops, custom cherry cabinets, a glass tile splash, energy- and water-efficient appliances, and even a filtered water stub out for the espresso maker. We demolished the old slab, excavated without undermining the shallow footings, installed new gravel, insulation, vapor retarder and concrete slab. The northeast basement corner was thermally isolated to become a root cellar that will store food produced by the entire yard’s conversion to permaculture. 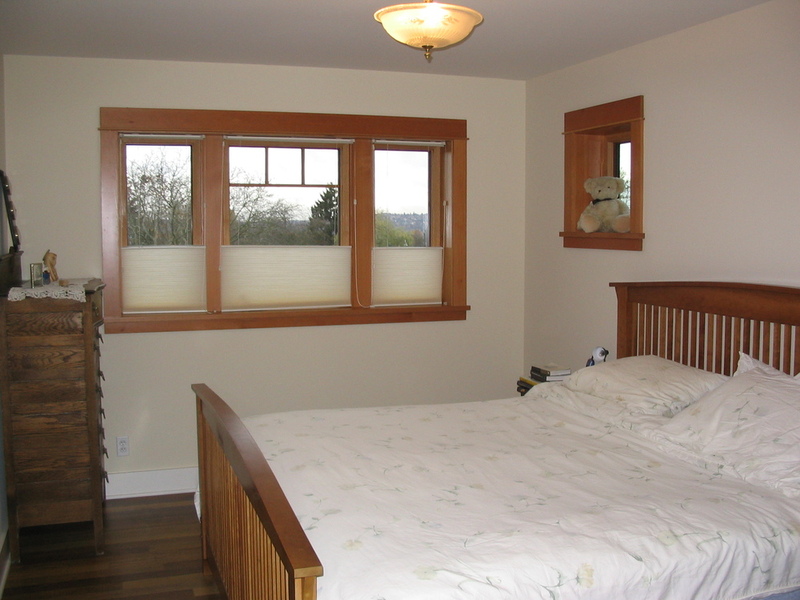 The basement now houses the guest bed and bath, family room, laundry, and mechanical room. The hazmat crew did all necessary plaster demo. Trim and doors were carefully removed, labeled, and stored for reinstallation. Lead RRP and construction indoor air quality procedures were vigorously followed. When the new HRV and flexible ventilation tubing arrived on site, we set up a clean room where all HVAC materials were stored and cut prior to installation to assure pristine air quality. The old laundry chute, our only existing vertical chase, had been promised three times over for plumbing, wiring, and ducts. So we routed the new fresh air duct from the basement HRV up through the old furnace chimney to the sky, a symbol of clean green replacing dirty fossil fuel.